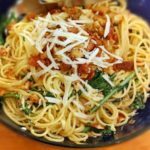 Pasta primavera with dandelion leaves: Spring is the time of a tremendous diversity and color in the garden on an opportunity to enjoy the simpler ingredients available like dandelion leaves. Our pasta primavera with dandelion leaves is a wonderful way of celebrating real Italian food since the Italians understand the healthy goodness of foods that can be gathered straight from the garden or the wilds of the countryside. During our time in Italy, it was not unusual to see folks, in particular Nonna and Nanna, gathering edible plants from the mountains, fields and roadsides. Such delicacies would include asparagus, arugula and dandelion leaves. 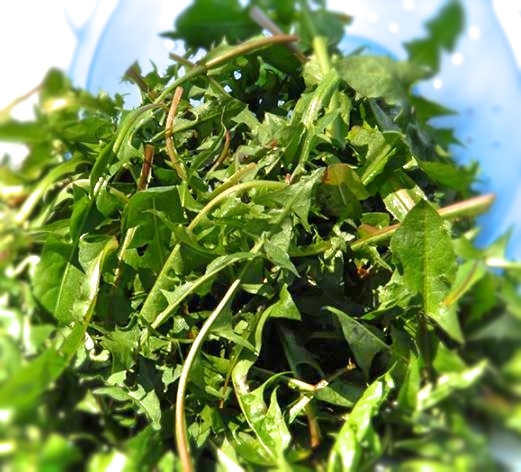 Dandelion leaves look similar to arugula (also referred to as salad rocket) but have a more bitter flavor when compared to arugula which is peppery. Arugula is great raw when added to salads and as a topping for salad pizza. By contrast, the best way to enjoy dandelion leaves is to blanch them prior to adding them to any dish and avoid eating them raw. If you are looking at the dandelion leaves in your garden, choose those that have not been sprinkled with weed-killing chemicals and make sure you wash them thoroughly in a lightly salted bath of cold water before blanching. They will wilt during the blanching process so always start with more than you think you need. You can go ahead and store your blanched dandelion leaves in the fridge or, like cooked spinach, in the freezer – first squeeze them as dry as you can. Bring a large pot of salted water to a rapid boil. Add the greens and wait for the water to resume boiling. Remove the greens after about 30 seconds to 1 minute and add them to a bowl of iced water. NOTE: This also works for spinach, arugula. More dense greens like collards and broccoli rabe, will require longer in the boiling water – up to 3 minutes. If you are using Pasta Nostra USA fresh spaghetti, first prepare the sauce. Over a low to medium heat add the oil to a large frying pan with the garlic. Allow the garlic to infuse the olive oil for about a minute. Remove the garlic and set it aside for later then add the pancetta. Cook for 3 – 4 minutes until the fat starts to render and the edges of the pancetta begin to brown and crisp. This can take a while so to speed the process, tip the pan slightly to one side to produce a deeper puddle of oil and stir the pancetta around in that. Bring a large pot of lightly salted water to a rapid boil ready to take the pasta. Add the onion and saute for another 1 minute until the onion begins to soften. Add the dandelion leaves and finely chop that piece of garlic then add it to the pan, along with some black pepper then give everything a good stir. Keep warm over a very low heat. Add the spaghetti to the water and cook according to the instructions on the packet. Up to 8 minutes for dry pasta and 4 or 5 minutes for fresh pasta. By the time you’ve drained the pasta, the greens should be ready. Remove the greens from the heat and add the drained pasta along with some extra virgin olive oil. Using a fork in each hand, toss the ingredients together. 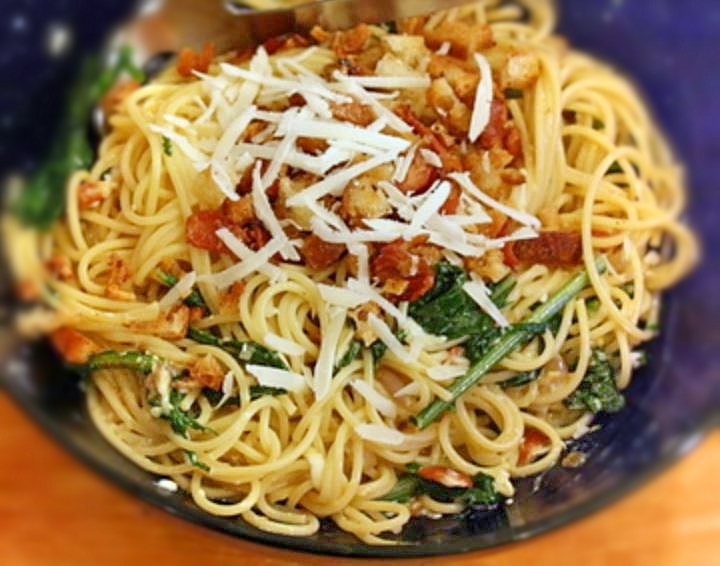 Serve immediately with some grated Parmesan cheese.